rooms Nexoe Welcome to Myregaard Bed & Breakfast and Apartments. A 4-winged farm from 1850 situated in a beautiful rural setting on the island. Close to forest and beach. 2 km to Dueodde golf courses. Close to bike paths and public transport. 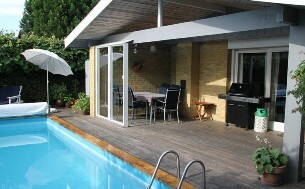 rooms Kokkedal Lovely garden with private swimming pool, several golf courses nearby. Delicious breakfast with homemade bread and jam. rooms Hoersholm Stay on a hobby farm, directly to Sjælsø. - In our lovely country house on the north side of Sjælsø is decorated 2 lovely "bachelors hybler", approx 40m2 overlooking Sjælsø. rooms Hilleroed Rose House is named after the fragrant roses in the front yard. Bed and Breakfast is decorated on the 1st floor of our lovely villa. Single, double and family rooms. All large, bright, attractive décor. The whole apartment is 75 sqm. Kitchen with dining area. rooms Gilleleje Nice Annex, super decor with its own kitchen, this all that is needed for morning midddags and evening meals. Sleeps four, dining table chairs, TV lounge DVD video television channels. rooms Gilleleje Nordstrand Bed and Breakfast in Gilleleje located in one of the city´s old and quite scenic areas, close to public transport and close to beach hills and the Kattegat.